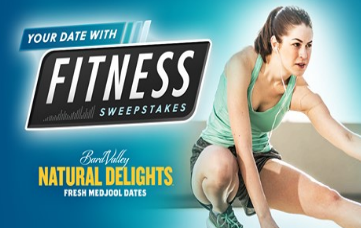 Medjool Dates Your Date With Fitness Sweepstakes – Win a FitBit Charge HR! Win a FitBit Charge HR (60 winners)! ENTER SWEEPSTAKES HERE – Medjool Dates Sweepstakes page. ENTRY LIMIT – LIMIT ONE (1) ENTRY PER PERSON/EMAIL ADDRESS PER DAY PER ENTRY PERIOD. ELIGIBILITY – The Your Date with Fitness Sweepstakes is open only to legal residents of the 50 United States and the District of Columbia and Canada (excluding Quebec), (the ” Territory”) who are 18 years of age or older and located in the Territory at the time of entry. SWEEPSTAKES ENTRY PERIOD – The Promotion begins at 12 noon Pacific Time on March 1, 2016 and ends at 11:59 p.m. Pacific Time on April 30, 2016. PRIZES – Sixty (60) Prizes (Thirty per Entry Period): FitBit Charge HR and 1lb Tub of Medjool Dates. (ARV: $154.99). Total ARV of all prizes per Entry Period is $4,647.